November 2, 2018. 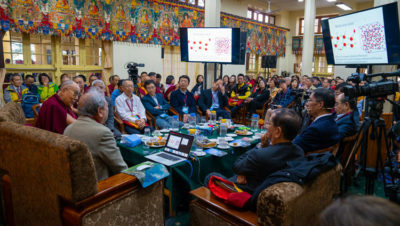 Thekchen Chöling, Dharamsala, India – It was colder, the sky was overcast and there had been rain when His Holiness the Dalai Lama walked to the Tsuglagkhang, the Main Tibetan Temple today to take part in a second day of discussions about quantum effects with Chinese scientists from Taiwan and the USA. Today’s moderator, Prof Albert M Chang, welcomed everybody to what he called a wonderful conversation. He mentioned that yesterday morning’s exciting exchange had been followed by a dynamic and inspiring discussion with science trained Tibetan monastics in the afternoon. He introduced the first presenter, Dr Ting-Kuo Lee who was to talk about superconductivity, a phenomena difficult to imagine in a classical physical environment. “Today it’s my great honour to share with you a beautiful phenomenon of the quantum world,” Dr Lee began. He explained that conductivity is a measure of how easy it is for an electric charge to pass through a metal. Superconductivity occurs when there is zero electrical resistance. 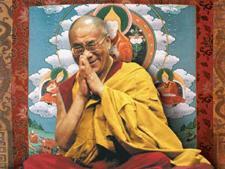 His Holiness asked if electricity is a wave or particles. Dr Lee replied that it consists of particles, but can also be a wave depending on the angle from which you look at it. He stated that the zero resistance of superconductivity is a quantum effect and that it also has magnetic properties including magnetic levitation that defies gravity. He discussed the movement of pairs of electrons that he compared to ballroom dancers. Prof Maw-Kuen Wu also discussed superconductivity, referring to the zero resistance discovered by Onnes in 1911 and perfect diamagnetism of the Meissner effect. He remarked that superconductivity is a novel quantum state which can provide lossless power transmission, with obvious benefits. It underpins the superconductivity levitation train that has been developed in Japan with advantages of speed, energy saving and low noise. Superconductivity also provides opportunities for more accurate medical diagnosis through magnetoencephalography and MRI. It also has applications in astronomy. Prof Chang also referred to chaos, differentiating between a ballistic chaotic-cavity in the shape of stadium and a non-chaotic cavity in the shape of a circle, which illustrates the linear superposition for the wave propagation of individual electrons. He asked if His Holiness had noticed a correspondence between the effects of quantum mechanics and anything in Buddhist philosophy. His Holiness replied, “In ancient Indian tradition, all destructive emotions are related to ignorance, mistaking appearance for reality. Therefore, two truths are explained—two levels of reality. There is naive realism which believes conventional appearances are real, which is to take an unexamined perspective on the world, and there is an examination of reality that yields wisdom in the face of this illusion. Quantum physics also distinguishes between appearance and reality. All things in samsara and nirvana are mere projections of your own mind. Abiding in the ultimate mode of being. Beginning his talk about water—a most unusual liquid, Prof Chung-Yuan Mou declared it was a great honour to talk about it to His Holiness. Then, with a laugh and a gesture to the pouring rain, remarked that the heavens were indicating their approval too. Water, he said, which makes up 60% of our bodies, is the most abundant and important substance for life. One of its unusual aspects is that it is shapeless, formless, odourless, colourless; it breaks all the rules. Most liquid frozen sinks, ice floats on water. Usually liquid expands when heated, water shrinks. It’s very accommodating. It is an excellent solvent for sugar, alcohol, ions, salt, amino acid and so forth. Water and oil do not mix; in fact, water is the opposite of fat. However, when photosynthesis takes place, solar energy is stored in water as sugar. The fundamental reason for the abnormal properties of water, the Professor explained, is the unusually strong hydrogen-bonding interactions between water molecules. On a practical level, Prof Mou observed that there are many parts of the world where people have trouble gaining access to water, especially clean water. 54% of India faces such water stress. He confirmed that scientists like him are seeking solutions to this problem. In response to the Professor’s asking him if it’s possible for there to be life without water, His Holiness drew attention to the role of water in the classic Buddhist accounts of the origins of the universe. These describe stages of space giving rise to formation, enduring, destruction of the universe and its ultimate return to space. In terms of the elements, the universe is described as evolving from space, air, fire, water and earth, dissolving in reverse order at the time of destruction. His Holiness made it clear he accepts the idea of the Big Bang and suggested that it comes about as a result of the energy of space particles. He mentioned that two Italian scientists told him the Big Bang took place 12 billion years ago. An American in Bombay said it was 25 billion years ago. Prof Yuan Tseh Lee reported that in his opinion it took place 30 billion years ago.